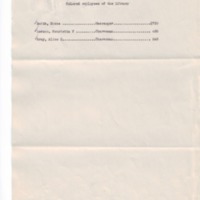 List of African-American employees in the USDA Library. In accordance with your request of July 14th I am enclosing a memorandum showing in tabular form the number of colored employees in the Library, the position held by each, and the salary paid. 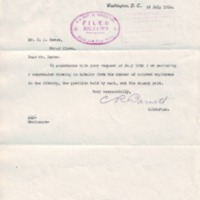 Barnett, Claribel Ruth, “CR Barnett to RM Reese,” 1914 July 16, DAG071614_3a-b, Race and Segregation Collection, Woodrow Wilson Presidential Library & Museum, Staunton, Virginia.